Contract workers claiming their rights at Nestlé's dairy factory in Kabirwala, Pakistan have been punished with the loss of their jobs and jailed by the score on fabricated charges as management seeks to criminalize the union's struggle in support of permanent jobs for contract workers. A capacity for aggression at Nestlé, the world's largest food company, is not limited to the aggressive pursuit of market share and aggressive cash flow management, qualities praised by investors and envied by competitors. It applies equally to industrial relations, where it receives considerably less attention. Violations of worker rights predictably make less headline noise than the latest quarterly results, a hefty dividend increase or the successful launch of a new product. 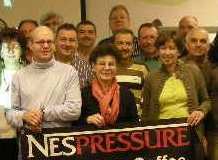 At the November 8 meeting of the Nestlé European Works Council in Geneva, Switzerland, representatives of twenty Nestlé unions from across Europe collectively called on the company to immediately halt attacks on trade union rights in Indonesia and in Pakistan. The unions insisted that Nestlé reinstate the dismissed trade union members in Indonesia and ensure their livelihoods and halt all harassment of trade unionists in Pakistan. Management at Nestle's giant Kabirwala dairy factory in Pakistan - a state-of-the art facility with a feudal industrial relations system - is criminalizing the union's fight for the rights of hundreds of contract workers at the plant. Click here to send a message to Nestlé! Report from the NECIC Steering Committee meeting in September 2011. Nestlé has announced that it has entered into a partnership agreement with the founding family of Singapore-listed Hsu Fu Chi, a leading manufacturer and distributor of confectionery products in China. Nestlé Purina UK has been fined GBP 50,000 after five workers suffered severe burns when a steam pressure system malfunctioned. The accident occurred on 4 August 2006.